In tonight’s edition of Planet Waves FM, my guests — Patricia Johnson and Mark Michaels — talk about a topic of interest to many, but explained by few: Tantra. They explain that tantra is different from Kama Sutra, which is about sexual technique. Mark Michaels and Patricia Johnson in their teaching space. They live in Westchester County, NY. Tantra is a cosmology, a way of approaching existence and a way of life wherein sexual energy is understood as flowing through everyone and everything. 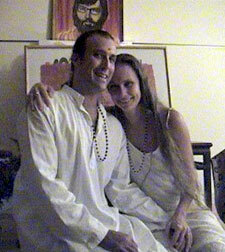 There are no strict rules to the practice, as you will hear; true tantra embraces everything. This philosophy can inform our relationships, our ideas about life and death, and can provide some grounding as we seek to understand who we are. I’ve waited a long time to bring on guests who are from the “sacred sexuality” angle of life, because until now I have not met people who I thought could relate the topic in a way that was down to earth, grounded in tradition and relevant in the modern world. I think I’ve found them…please let me know what you think. My guests can be reached at their website, TantraPM.com. They are the authors of several books which are described on their website, they teach classes, do private work and host a social event in New York City once a month. This is part one of a two-part series, which will continue next week.